There’s a newer, easier way to create 2 column forms in Pardot. Click here to learn the best way to create a 2 column Pardot form. After launching my Form Style Generator for Pardot Forms, the number one question I receive is ‘how do I create a 2 column form in Pardot?’ I might update the style generator to include this in the future, but in the meantime, here’s how to create a 2 column Pardot form with minimal coding. As you can see the field is wrapped within a paragraph tag and there’s a DIV below that to display any error messages. 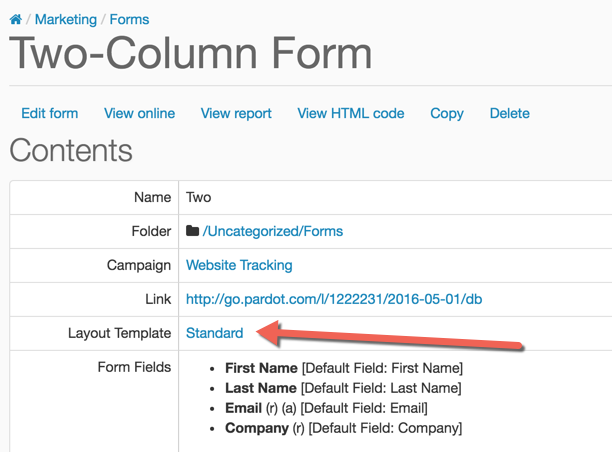 The first step to creating a 2 column pardot form is to add a DIV to your layout template. Navigate to your form by going to Marketing > Forms and click on the layout template link to take you to the template assosicated with the form. Edit the layout template and navigate to the form tab. Scroll down in the code until you see %%form-start-loop-fields%% (around line 17) and paste this code directly after %%form-start-loop-fields%%. Scroll down into the code until you see %%form-end-loop-fields%% (around line 32) and close the DIV on the line before %%form-end-loop-fields%%. Add this to your the bottom layout template to create a two column form. Depending on what your landing page looks like, you might want to add in a width to the columns. This is great. What would do if you want it to be more responsive? When viewing on a desktop, get 2 columns. But if you're viewing on a smartphone you would only get 1? Is the best choice to create 2 identical forms with 2 different layouts? Then on the website hide Form 1 with 2 columns based on the pixel width and show Form 2? Hi Brian, You wouldn't need to create 2 forms. You can create 1 form and add some CSS media queries to enable a 1-column form on mobile. Do your landing pages use any sort of web framework (Bootstrap or Foundation)? Using one of these would help a lot since they already have all the CSS already done for you. Actually, if you plug in bootstrap css you can just assign a class to the field. col-sm-6 for 2 column col-sm-4 for 3 column, etc. No extra styles needed. That's a great tip, thanks Katy! One question: How do you show the field labels within the form field in Pardot? Do you have any examples / example code for this? Many thanks for this! If I wanted 2 fields to be as a 2 column layout but then the other fields to be displayed underneath (one per row) how could I do that? Hi Sarah, that's a bit more complicated but totally do-able. Send a link to the Pardot form along with the fields you want as 2-columns to [email protected] and I can help you out. Hi there, thank you for this article, helps a lot. I was wondering if you could tell me what to change for a 3 and/or 4 column form if you don't mind. Thank you!